TShirts365 we love you and wouldn’t mind having your babies. Just days after we were pondering the potential for naughty schoolboy mischief provided by Kaka’s I Belong To Jesus t-shirt, and the gang at TShirts365 respond with this beauty. Pies reader Mike had touted an I Belong To Kaka t-shirt, but we can cope with this semi-namecheck! 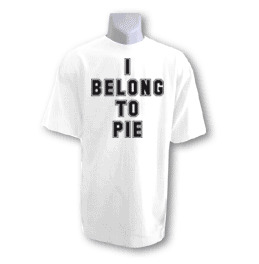 To buy the I Belong To Pie t-shirt for Â£14.99, click here.